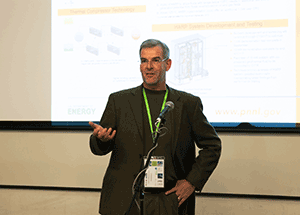 McGrail pitches the HARP system to the award selection panel at the Energy Future Conference in Sydney, Australia. In the power generation industry, efficiency and cost-effectiveness are crucial, but not so easy to achieve. Thanks to a project funded by the U.S. DOE’s Geothermal Technologies Office and directed by Laboratory Fellow Pete McGrail, it’s becoming easier to generate power efficiently and economically from low-grade heat sources. This can save fuel in military facilities and remote communities. McGrail’s research is getting international attention. During the Energy Future 2016 Conference held in July at the University of New South Wales in Sydney, Australia, McGrail was recognized with an Innovation Award for development of the Harmonic Adsorption Recuperative Power System (HARP). The Energy Future Innovation Award is presented to an individual or team that did the best job demonstrating that their technology or research has potential for high-impact developments that will eventually become new energy technologies. HARP is a novel hybrid system that uses low-grade heat to generate electric power, and it may just be the answer industry has been looking for to reduce costs and increase efficiency. Innovations in the HARP system are being developed with key contributions from McGrail and his PNNL colleagues, JJ Jenks and Radha Motkuri, as well as industry partners William Abrams of Advanced Thermal Sciences, Inc., James Abrams of EthosGen LLC, and Jack Haight of InnaVenture LLC. A thermodynamic process where heat is transferred to a fluid at a constant pressure. The fluid is vaporized and then expanded in a turbine or engine that drives a generator, producing electricity. The beauty of the HARP system is that it generates power 40 percent more efficiently than standard Organic Rankine Cycle (ORC) systems, and at noticeably competitive rates— below $0.07/kWh. Conventional ORC systems typically produce power at a cost of around $0.15 to $0.20/kWh. By introducing PNNL’s patented multibed adsorption architecture directly into the power generation cycle, a larger pressure and temperature drop across the expander is produced, generating more power. The adsorption thermal compressor that forms the heart of the HARP system has been under development for five years at PNNL for adsorption cooling applications. McGrail and his team are adapting this technology by integrating newly developed molecular engineered nanomaterials into the HARP generation system. In the U.S. geothermal power sector alone, this system could potentially quadruple current power production. Another significant impact of this technology is its ability to reduce fuel consumption for power generation on ships, at military bases, and in remote communities that use diesel generators to produce power. These applications require a power generation system with minimum size, weight, and cost, which is exactly what the HARP system can deliver. Pete McGrail is the Principal Investigator of the HARP project and has attained the position of Laboratory Fellow, the highest level of scientific achievement at PNNL. He is the manager of the Applied Functional Materials team, and directs a diverse range of projects involving chemical reaction, mass and heat transport processes in porous and nanostructured media. He holds five patents and has more than 275 publications and presentations on his research. JJ Jenks is the lead development engineer on the HARP project. Since joining PNNL in 2009, Jenks has been involved in numerous projects combining experimentation and modeling in thermal/fluids sciences. He is fluent in use of AspenPlus® to model cyro-separation of CO2 from flue gas for coal fired power plants in addition to modeling adsorption chillers. Radha Motkuri is a materials scientist at PNNL. He has over 13 years of experience in development of porous materials (zeolites, mesoporous silica and MOFs) and applying them for various applications including catalysis, CO2 capture, and adsorption cooling. William Abrams is a defense and aerospace business executive with a proven record of bottom line growth results. He has significant experience as a strategic member of leadership teams for major aerospace corporations and subsidiary Advanced Thermal Sciences. Jack Haight is the CEO of InnaVenture LLC. He has over 45 years of experience in the chemical process industry, including marketing, sales, research, and manufacturing as an executive with DuPont. James Abrams is a founding principal of EthosGen LLC and one of the foremost emerging energy experts and entrepreneurs. He has won numerous awards for entrepreneurs.